Do dogs smile at their dog-parents? Is it the same as a dog kiss? Or is it a myth? You have had a long, strenuous day at work. You drive the same, traffic-jammed route home. Thirty minutes later, you’re finally home. You then pull into your driveway and there it is. Eyes filled of pure joy, and those beautiful “pearly whites” (with maybe not the best smelling breath), getting closer and closer as your four-legged best friend runs towards you. Suddenly, happiness washes over you, you feel the stress of your day leave your body. Your once cold and stiff look is now replaced with a smile spread from ear to ear. Yes, a smile from you and your dog. 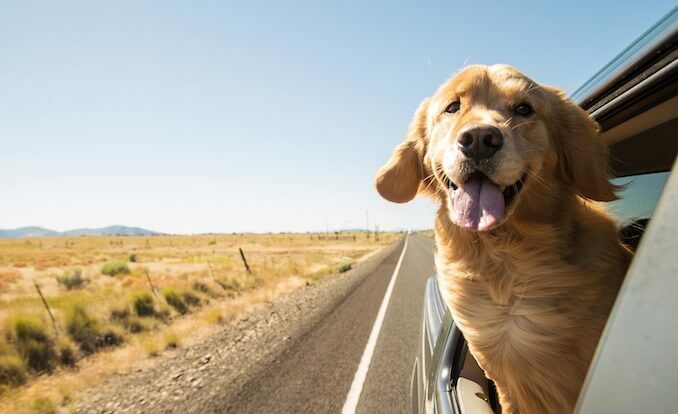 The question is, do dogs smile, and if they do smile – do they mean it? As dogs are able to experience affective states, they may be able to express them through emotional cues such as a smile. Firstly, what is a human smile? A smile is the formation of one’s features so that their mouth is turned up with or without their teeth exposed. In humans, a smile is associated with delightful emotions (i.e. being happy!). However, is this the same for a dog’s smile? Emotions are formed by the limbic system in the brain which is responsible for a variety of functions such as memory, motivation, behaviour and emotion. This results in either a positive or negative conscious mental state. It is strongly evident that the mammalian brain differs across species, with the human brain being one of the most well-developed. This is therefore true in comparison to canine species. For example, a human has a highly developed neocortex in comparison to the dog (the neocortex is an area of the brain which is associated with higher order thinking). As dogs have a less developed neocortex; questions have risen, if dogs are capable of experiencing emotional intelligence. However, in 2012, scientists at the University of Cambridge concluded that “the lack of the neocortex does not impede a non-human animals’ ability from experiencing emotions (i.e. affective states)”. The same scientists stated that non-human animals are also “capable of exhibiting intentional behaviours due to the presence of similar neurological structures” in their brains. So, dogs do smile after-all! But does this mean the same as a human smile? There are several reasons for why dogs smile: Attention, Anticipating Pleasure and Enjoying Moments. It’s true, dogs can be show-offs and love our attention. Dogs love to show-off as they receive an excited response from us. Our joyful response drives our pet to perform a certain action again. When a dog smiles at us, we correlate this with happiness and this is evident to our canine friend. We praise them for smiling at us. We praise them for being cute and friendly. Therefore, giving them a positive response and our attention. Which of course, they love! The pleasure of anticipation is enforced by the reoccurrence of positive cues. A classic example of this understanding comes from a training technique known as operant conditioning. Operant conditioning is a common training technique. Put simply, it is based on the principle that a dog will do as asked, because of what is to follow. You ask your dog to sit, finally he sits as asked. He then receives praise “Yay! Good boy”, and a small reward such as a tasty pineapple snack. This is done over and over again. Your dog now knows the outcome of the word “sit”, and is thus positively conditioned to do so. 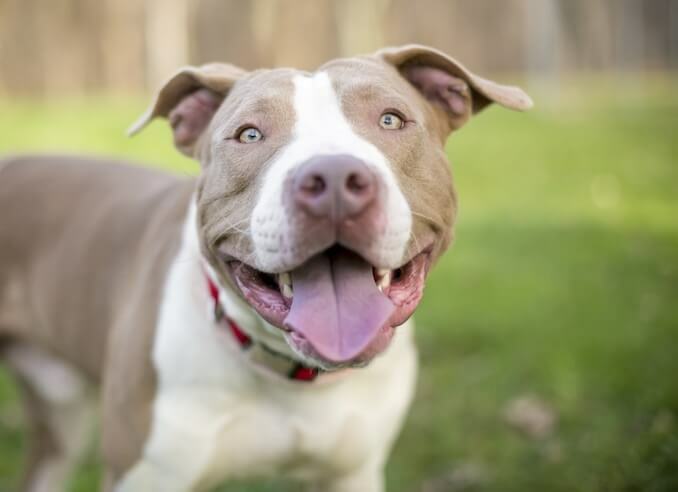 If an action (such as a change in facial expression like the formation of a smile) is continuously linked to joyous and positive aspects; then the canine will become familiar with this cue and continue to link it to the said positive aspects. So your dog may be smiling because you taught him to! 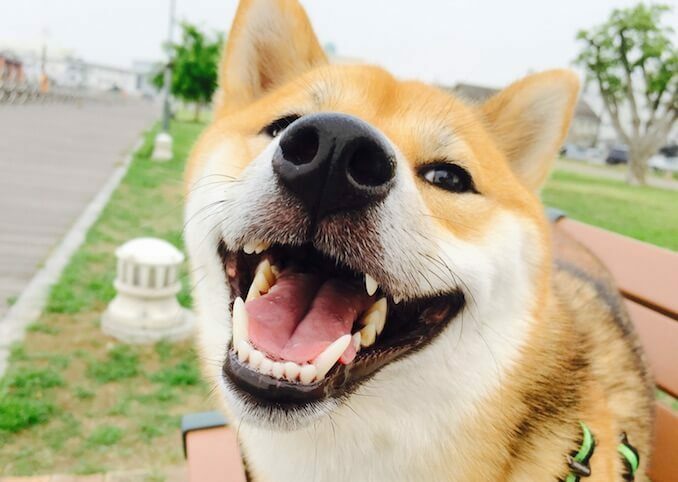 Like humans, dogs may use a smile to summon or seek owners or friends. As a smile is seen as a positive attribute, a dog has learnt to use this expression in a way to summon or seek friendship or affection. A dog is basically using the smile as a form of communication to say “Hello, everything is ok, you can approach and play with me”. If dog’s communicate with a smile, how else do dogs communicate with humans? Sadly, dogs are not fluent in any verbal human language. Although we like to think our pet can understand us, especially dog’s full of life like a puggle, they are incapable of speaking back to us. However, this does not mean that we cannot communicate with them and it does not mean that they do not communicate with one another. Verbal and physical cues (i.e. dog body language) help us communicate and understand a dog’s behaviour. Smile Again, the gorgeous smile that we love so much. Usually, when a dog smiles it is known as a submissive grin. His posture is relaxed, and his teeth may be exposed. It is important to note that the exposure of teeth is not always a sign of aggression like some people may believe. Bark A bark is the classic sound associated with dogs. 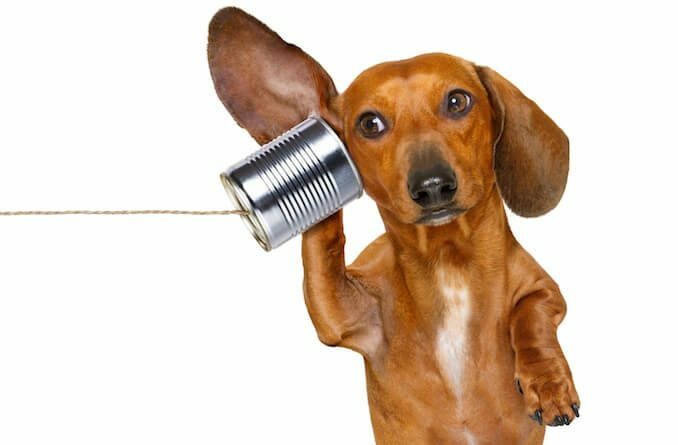 It is strongly believed that barking is associated with the domestication of dogs (with the first dog remains dating back to 36,000 years ago). However, a bark may depict a range of behaviours including: fear, dominance, play, greeting, call for attention, and warning. Eye Contact As you and I both know, a lot can be said with eye contact alone. The way someone stares at you across the room can either be due to love and devotion, or it can be intimidating and be seen as a challenge. The same is true for dogs. Avoiding Eye Contact The avoidance of eye contact in dogs, is similar to the avoidance of eye contacts in humans.The most common meaning is that your dog is feeling nervous and is trying to avoid the situation. Sometimes, after you dog holds eye contact, and then looks away, it’s a sign of trust. Dogs have stuck by our side throughout history (e.g. The German Shepherd US Marine Corps war dog, Lex). 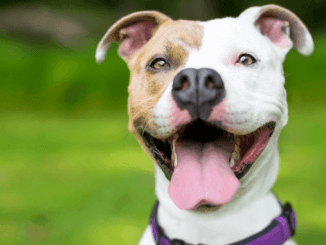 So now that we understand the different reasons for why dogs smile, what makes their human friend smile back and are there health benefits behind a smile? There have been several scientific studies and surveys surrounding this topic. So are people happier with dogs? The findings indicate, yes! – Over 70% of dog-parents reported their dog makes them a happier person. People from dog-related households are found to be happier, calmer, and even more out-going. Companion animals (such as dogs) interact with their owners in a manner that people would. Pets are no longer perceived as just pets, but they are frequently seen as an additional family member. An additional family member who provides them with emotional support and social interactions just as a human being would. 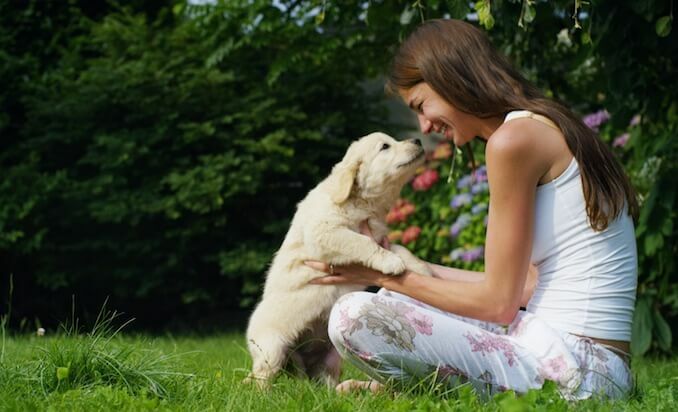 As dogs and humans are able to communicate effectively (through non-verbal cues), they are therefore able to bond and produce similar feelings of happiness. 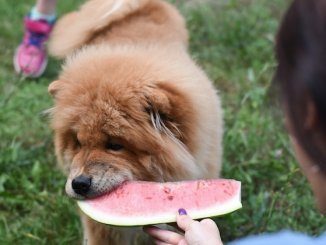 There are several health benefits which are associated with living with dogs. This ranges from being fitter due to physical exercise. The American Heart Association says that dog owners are over 50% more likely to achieve the recommended level of physical fitness a day. In addition to the increased walking because of your dog, there is improved mental health due to the release of oxytocin, serotonin, and dopamine. Oxytocin otherwise known as the “love hormone” is released when mothers bond with their babies. Scientists have found that the same hormone is released when our pet dogs look into our eyes. It is the release of this hormone which provides evidence as to how dogs are excellent companions for people who suffer from neurological-related issues such as autism, PTSD, and anxiety. Finally, dogs are able to provide health benefits to those in need. Dogs are actually able to detect lowered blood sugar and therefore help diabetic patients, help people during seizures, guide the blind, be trained to detect foods which their owner may be allergic to and also detect cancer. So there is far more behind the smile of your loving dog than your first thought. Dogs do in fact smile. Or at least, mimic our facial expressions to please us. As you may know if you are a dog owner yourself, dogs have also been known to laugh. A dog’s laugh begins with a smile, and is followed by a soft noise which actually resembles panting (hence the confusion). Why Does My Dog Smile at Me? There is still a lot of debate as to why your dog may be smiling at you. However, if it is your own dog then the most common reason for his/her smile is you. A dog is able to correlate smiling with happiness (as he has learnt this from you! ), and therefore, when your dog is smiling at you, he is smiling to please you and make you feel warm inside. Does It Mean My Dog is Submissive if They Smile? Yes, if your dog is smiling at you then it can be a form of submission. However, you need to further understand dog body language before making this assessment. A smile from your loving dog is endearing and very common. There really is no better feeling than seeing your pooch smiling back up at you. A dog is able to recognise emotions and a smile is seen as a positive attribute. A dog mimics your expressions as a form of positive communication and learned behavior through operant conditioning. Dogs may smile for a number of reasons including wanting attention, anticipating pleasure and recognizing their owner. According to scientists, dogs themselves are providers of both physical and mental health benefits for the human species. So remember, a dog a day may in fact keep the doctor away. Do you live with a crazy pooch who loves to smile?! Let us know in the comments below.